Hi and congrats on this great project! On your photos/videos there is a bumper assembled with two screws / screw holes. Can't find it in Evo or Evo2 part list. Is it possible for you to release it here too - at least the dimensions of the card you used? Thanks in advance. thanks! You can print them: "BUMPER 3D printed V1"
Hi! What stepping motors can replace 1703HS168A? Sorry if I missed it, but I have been looking for the recommended size of the o-rings for the wheels. Thanks! Great, thanks for the quick reply. I have printed the one for the O-Rings. It looks like I should get a 4x82mm O-ring? Do you know the size? What is considered as an alternative for the brain shield ? Planning to do it as a class project. Thank you so much for the quick response. Another question, what are the sizes for the bolts and nuts? Where are the files for the servo clamp seen at 1:07 in the video? There shouldn't be an issue adding a 2.4ghz receiver into this project for remote control via a transmitter instead of wifi correct? I believe there are arduino libraries for the frsky protocol. Anyone make a cool stand for the robot? I'm a little confused about how the different bumpers mount. I though I would be able to use the front top bumper with the add on bumpers, but couldn't really find a set of workable holes. I just ended up using the front top stl for both sides. Am I missing something about how these mount? 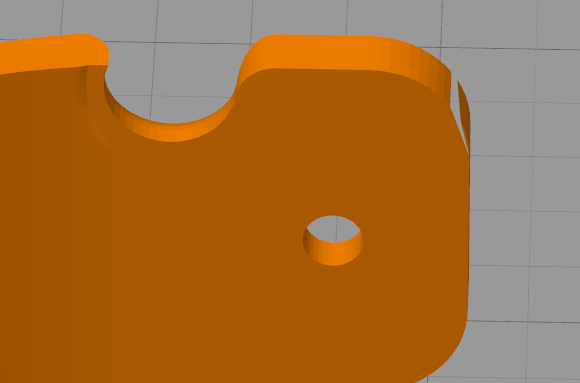 There is a problem when printing the bumper (Bumper [V9] (optional).stl). 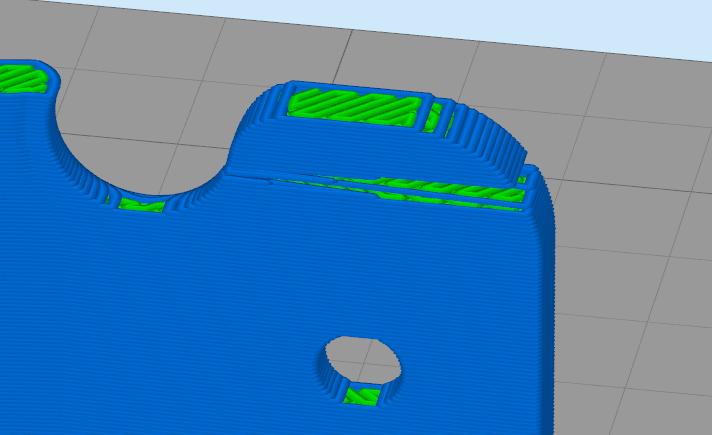 There is a bump right on the first layer (layer1.png) so that the model doesn't stick to the printer bed properly and can't be 3D printed. There are also two holes for screws on each side in the middle, not four holes (one above, one below on each side) as in a model picture above. Could you have a look? Thanks for sharing the design. I put all together like in the instruction video. But now, the robot does nothing. I can turn on and nothing happen. I could connect via wifi to the robot but no action happen. I dont know whats wrong know because I had it already 3 times on and played with them. I also tried to upload the firmware again. Now the Robot works, I dont know why? How long does it take to intialize before it comes to life after turning on? The mounting of the IMU is fine. Nothing is touching each other. If the initalization does not work, I disconnect the IMU and all works then. So I think the problem is caused by the IMU. Thank you very much for your offer. :-) I appreciate your help very much. I will buy a new IMU on my own. An IMU is not very expensive and I could get it in Germany very fast with in two days. I am going to replace the IMU then and test the other one, but at the moment the bot works very fine. :-) Only the initialization needs some time. Now I try to understand the code, how the bot works. ;-) It is a new filed for me, but I am very interested and your JJ website discribe it very nice. Thanky for these nice project. :-) Your project are all very very well elaborated. Nice discribtion, part list, where to buy, instruction, background information, technical information, challenges to choose, I like it. Sometimes it works and sometimes not. What LiPo can I use? I know 3S type but how big in terms of dimensions could the LiPo be? How to print the bumpers? I can't set them on the long sides because the sides have not an even level? I will order next month an Electronic Kit in your jj Shop. 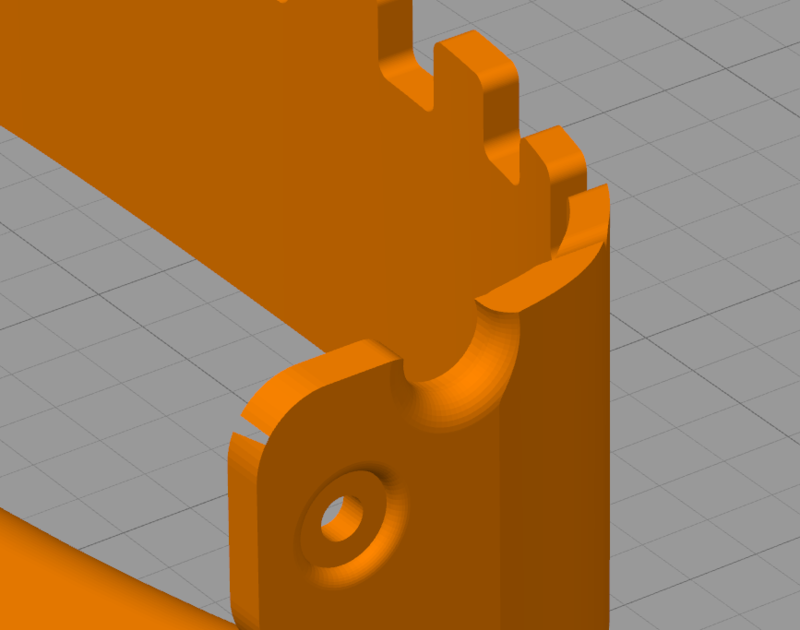 I set the default bumper manually 0,3mm more down in Simplifiy to have an even surface. A brim will not work is you have not an even surface that is in full contact with the print bed. Nice project I plan to build it in December/January. Where can I find the firmware for the Arduino? I am having real problems printing these files - e.g in slicr the wheel hubs fill in i.e so there is no axle hole. Baught the complete kit, and i am so happy with the iboardbot, fantastic ! Do you plan to create an IOS App to use this robot with an iphone or iPad, i dont have Android platform. I love this robot, while I'm printing and waiting for the brain I designed 2 cartoon arms. I made a set of tire treads for the wheels printed with flex filament. Can I use an Arduino Uno as the "Brain?" No.The processor the Leonardo uses allows two TIMERs (used to control the stepper motors with accuracy). We needed those two timers to handle interruptions and the Arduino UNO is not capable of doing that. And Arduino Mega can, but it was a little bit too expensive. Hi guys! Excellent job, i like it! Please publish stl file with standart bumper! Thx! We have uploaded the "FRONT TOP bumper". In the case you do not want to use the "customizable" ones. It is an alternative bumper. Print one for the front and another for the back side of the robot. Say thanks by giving jjrobots a tip and help them continue to share amazing Things with the Thingiverse community. 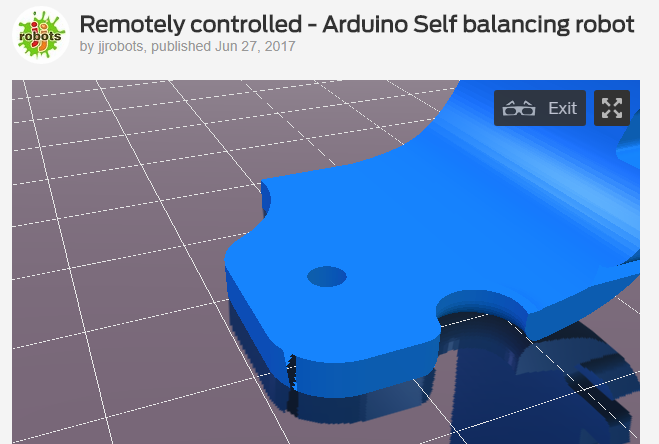 Remotely controlled - Arduino Self balancing robot by jjrobots is licensed under the Creative Commons - Attribution license. Say thanks and help jjrobots continue to share amazing Things with the Thingiverse community. You'll need a PayPal account to tip jjrobots. Click the button below and you will be redirected to PayPal. Once the payment is complete, you'll be brought back to Thingiverse.